When doing it for the 'Gram goes wrong. Turns out the year's hottest accessory is also the same one that'll get you stranded in the middle of a giant lake. Yep, those giant pool floats are all fun and games while getting the perfect Insta pic until you float into a part of a lake that looks more like Shrek's swamp than anything you'd ever want to dip your toe in, which is exactly what happened to a group of women in Minnesota last week. 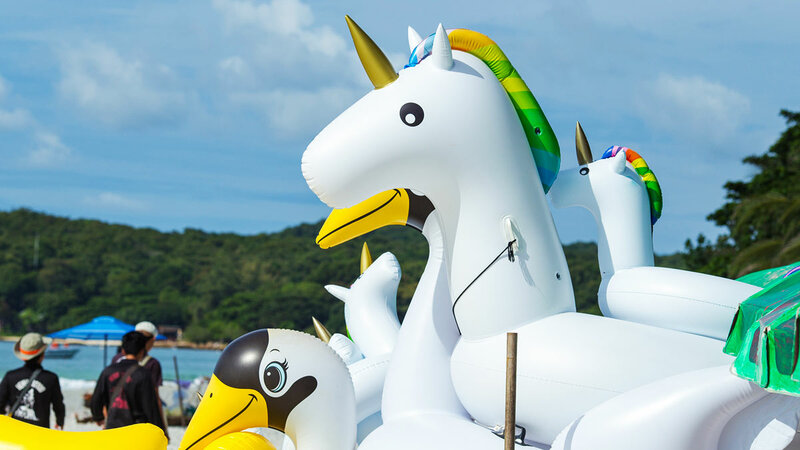 According to the Chisago County Sheriff's Office's Twitter, two deputies were passing by Fish Lake near Stark, Minnesota when they saw a group of women on a giant unicorn pool float in the middle of a sludge-y lake. Reportedly, the deputies went over just to ask for a picture (maybe they've been MIA from the Internet and haven't heard of a unicorn float before), but when they got closer, they noticed the women were stuck in a bunch of weeds. Once the deputies realized the five women were stuck, one deputy sprung into action with his "mad rescue roping skills" to save the stranded women while the other deputy, thankfully, caught it all on video. In the video, you can see the women trying and failing to paddle out of the weeds before the deputy threw a rope to reel them in. Consider this your warning to check the water before floating! It's not all smooth sailing out there!